The Power Law model is a popular method for analyzing the reliability of complex repairable systems in the field. In this article we first give a brief introduction to the Power Law model and we then give an example that shows how to use Power Law model in RGA to estimate the conditional reliability of a group of systems. In the real world, some systems consist of many components. A failure of one critical component would bring down the whole system. After the component is repaired, the system has been repaired. However, because there are many other components still operating with various ages, the system is not put back into a like new condition after the repair of the single component. The repair of a single component is only enough to get the system operational again, which means the system reliability is almost the same as that before it failed. For example, a car is not as good as new after the replacement of a failed water pump. This kind of repair is called minimal repair. Distribution theory does not apply to the failures of a complex system; the intervals between failures of a complex repairable system do not follow the same distribution. Rather, the sequence of failures at the system levels follows a non-homogeneous Poisson process (NHPP). Here T is the system operation end time and N(T) is the number of failures over time 0 to T.
K is the number of systems under study. q is the index of the qth system under observation from time Sq to Tq. Nq is the number of failures experienced by the qth system. Xi,q is the age of this system at the ith occurrence of failure. 0ln0 is defined to be 0. If XNi,q = Tq then the data on the qth system is said to be failure terminated and Tq is a random variable with Nq fixed. If XNi,q < Tq then the data on the qth system is said to be time terminated and Nq is a random variable. There are two kinds of reliability confidence bounds available in RGA: the Fisher Matrix confidence bounds and the Crow confidence bounds. The variance can be calculated using the Fisher Information Matrix where Λ is the natural log-likelihood function. The values of ρ1 and ρ2 can be obtained by finding the solution c to for and , respectively. The values of Π1 and Π2 can be obtained by finding the solution x to and , respectively. I1(.) is the modified Bessel function of order 1. The following example shows how to use the Power Law model in RGA. 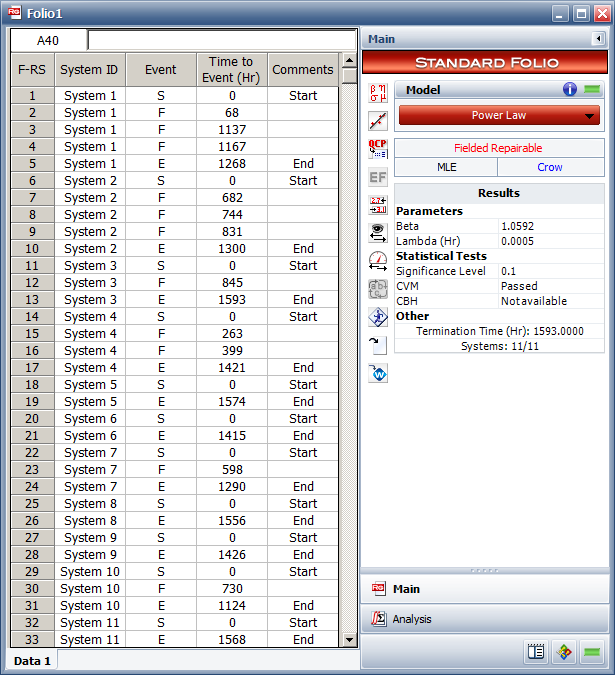 Table 1 shows the failure times for each unit in a sample of 11 systems in a fleet. The end time is the last recorded known age when the analysis was performed. The end time for each unit is less than the last failure time (if the unit has failed), thus the data set is time terminated data. 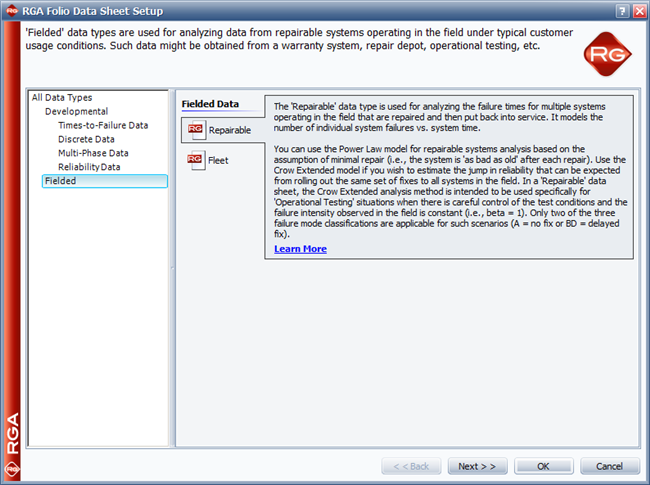 Step 1: In the Data Sheet Setup window, choose the "Repairable" data type in the "Fielded" category. Step 2: Add the failure data to the data sheet, then click the Calculate icon to estimate the parameters using the MLE method with Crow confidence bounds. As shown below, the estimated parameters are , and . Step 3: Click the QCP icon to open the Quick Calculation Pad. Select the Reliability option and enter the inputs as shown below. 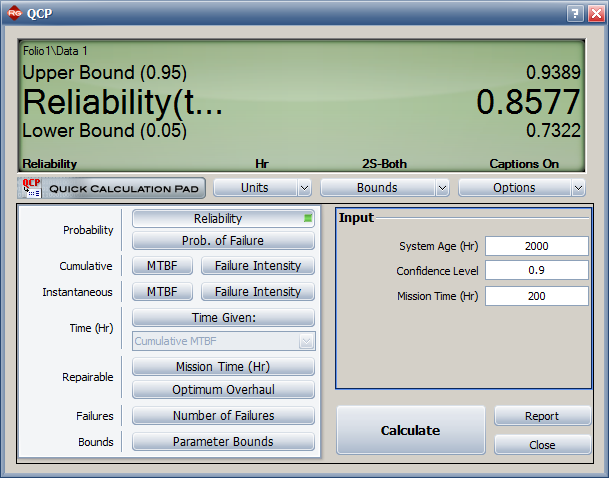 Using a Time/Stage value of 2000 and a Mission Time value of 200, and using two-sided	confidence bounds with a confidence level of 0.9, the conditional	reliability is 0.8577 with an upper confidence bound of 0.9389 and a lower confidence bound of 0.7322. This article briefly introduced the Power Law model, and then described the equations for estimating the conditional reliability and its bounds. Finally an example using RGA provided an illustration of using the Power Law model.